This GATES Engine Timing Belt Component Kit with Water Pump TCKWP fits your 00-05 Subaru Outback SOHC 2.5L H4 and offers the best and most complete repair solution for your vehicle. SixityAuto Car Truck Van Wheel Wiper Blades. Spark Plugs, Boots & Wires. Timing Belts & Water Pump Kits. 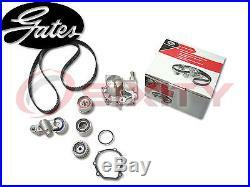 GATES 00-05 Subaru Outback SOHC 2.5L H4 Timing Belt Water Pump Kit TCKWP OE hd. You will receive the parts shown in the picture above. Gates Timing Belt Component Kits with Water Pump offer the best and most complete repair solution for your vehicle. These kits include the same OE timing belts, pulleys and tensioners found in the Timing Component Kit (TCK) in addition to a high performance water pump. Aramid reinforced nylon jackets and back side jackets for longer wear. High grade HNBR rubber for superior heat and contamination resistance. PTFE infused jackets to reduce frictional losses and tooth shear. Not all tensioners and idler pulleys are created equal. Gates pulleys, idlers, and hydraulic tensioners use advanced metallurgy and casting techniques to ensure industry-leading corrosion and fatigue resistance. Everything you need to do the job right, all in one box. Detailed, vehicle specific installation instruction for quick repair and rebuild. Gates Water Pumps are designed and built for long lasting, efficient cooling. They feature a one piece integrated shaft impeller and pulley to increase service life and decrease pump failures due to loose components. Because of wear and loading, timing belt driven water pumps should be replaced at the same time as the timing belt. Water Pumps are designed and built for long lasting, efficient cooling. Everything you need to do the job right , all in one box. Sorry, no local pickups available. Sixity Auto stands for value, selection and quality. Many of the parts we sell at Sixity Auto only work with specific vehicles. Please double-check the accuracy of your order before purchasing. Check that the reference number, size, and placement are correct. With any product or fitment questions. If the item has been installed and/or used, we are unable to accept a return due to safety concerns with used parts. Please refer to our contact page. For details on how and where to send a return. Launched in 2006 and is based outside of Sacramento, California. We have a dedicated team of product engineers, technicians, and sales staff to bring you the best possible products for your car, truck, motorcycle, snowmobile, or ATV. Sixity is American-owned and operated. With any questions about our business or products. All questions are handled locally by personnel in our California offices. The item "GATES 00-05 Subaru Outback SOHC 2.5L H4 Timing Belt Water Pump Kit TCKWP OE hd" is in sale since Tuesday, January 26, 2016. This item is in the category "eBay Motors\Parts & Accessories\Car & Truck Parts\Engines & Components\Timing Components". The seller is "sixityauto" and is located in Sacramento, California. This item can be shipped to United States, to Canada, to United Kingdom, DK, RO, SK, BG, CZ, FI, HU, LV, LT, MT, EE, to Australia, GR, PT, CY, SI, to Japan, to China, SE, KR, to Taiwan, ZA, TH, to Belgium, to France, to Hong Kong, to Ireland, to Netherlands, PL, to Spain, to Italy, to Germany, to Austria, RU, IL, to Mexico, to New Zealand, PH, SG, to Switzerland, NO, SA, UA, AE, QA, KW, BH, HR, MY, BR, CL, CO, CR, DO, PA, TT, GT, SV, HN, JM.